"Nursultan" redirects here. For other uses, see Nursultan (disambiguation). Astana,[a] officially known as Nur-Sultan,[b] is the capital city of Kazakhstan. It is located on the banks of the Ishim River in the northern portion of Kazakhstan, within the Akmola Region, though administered separately from the region as a city with special status. The 2017 official estimate reported a population of 1,029,556 within the city limits, making it the second-largest city in Kazakhstan, behind Almaty. Astana became the capital of Kazakhstan in 1997, and since then has developed economically into one of the most modernized cities in Central Asia. On 23 March 2019, following a unanimous vote in Kazakhstan's parliament, the city was renamed Nur-Sultan, after former president Nursultan Nazarbayev. Modern Astana is a planned city, much like other other planned capitals. After Astana became the capital of Kazakhstan, the city cardinally changed its shape. The master plan of Astana was designed by Japanese architect Kisho Kurokawa. As the seat of the Government of Kazakhstan, Astana is the site of the Parliament House, the Supreme Court, the Ak Orda Presidential Palace and numerous government departments and agencies. It is home to many futuristic buildings, hotels and skyscrapers. Astana also has extensive healthcare, sports and education systems. Founded in 1830 as a settlement of Akmoly or Akmolinsky prikaz (Russian: Акмолинский приказ), it served as a defensive fortification for the Siberian Cossacks. In 1832 the settlement was granted a town status and renamed Akmolinsk (Russian: Акмолинск). On 20 March 1961 the city was renamed Tselinograd (Russian: Целиноград, lit. 'City of tselina') to mark the city's evolution as a cultural and administrative center of the Virgin Lands Campaign. In 1992 it was renamed Akmola, the modified original name meaning "white grave". On 10 December 1997 Akmola replaced Almaty as the capital of Kazakhstan. On 6 May 1998 it was renamed Astana, which means "capital city" in Kazakh. On 20 March 2019, the capital again was renamed from Astana to its current name Nur-Sultan in honor of the long-serving Kazakh President Nursultan Nazarbayev. The settlement of Akmoly, also known as Akmolinsky prikaz, was established on the Ishim River in 1830 as the seat of an okrug by a unit of the Siberian Cossacks headed by Fyodor Shubin. The name was possibly given after a local landmark—Akmola literally means "a white grave" in Kazakh—although this theory is not universally accepted. In 1832, the settlement was granted town status and named Akmolinsk. The fairly advantageous position of the town was clear as early as 1863 in an abstract from the Geographic and Statistical Dictionary of the Russian Empire. It describes how picket roads and lines connected this geographic center to Kargaly in the East, Aktau fort in the South and through Atbasar to Kokchetav in the West. In 1838, at the height of the great national and liberation movement headed by Kenesary Khan, Akmolinsk fortress was burned. After the repression of the liberation movement, the fortress was rebuilt. On 16 July 1863, Akmolinsk was officially declared an uyezd town. During the rapid development of the Russian capitalist market, the huge Saryarka areas were actively exploited by the colonial administration. To draft regulation governing the Kazakh Steppe the Government of the Russian Empire formed Steppe Commission in 1865. On 21 October 1868, Tsar Alexander II signed a draft Regulation on governing Turgay, Ural, Akmolinsk and Semipalatinsk Oblasts. In 1869, Akmolinsk external district and department were cancelled, and Akmolinsk became the center of the newly established Akmolinsk Oblast. In 1879, Major General Dubelt proposed to build a railway between Tyumen and Akmolinsk to the Ministry of Communications of Russia. In the course of the first 30 years of its existence, the population of Akmola numbered a trifle more than 2,000 people. However, over the next 30 years the city's population increased by three times according to volosts and settlements of the Akmolinsk Oblast. In 1893, Akmolinsk was an uyezd with a 6,428 strong population, 3 churches, 5 schools and colleges and 3 factories. 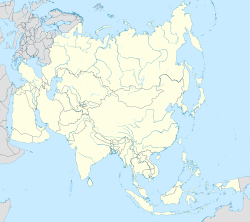 In 1954, Northern Kazakh SSR oblasts became a territory of the Virgin Lands Campaign led by Nikita Khrushchev, in order to turn the region into a second grain producer for the Soviet Union.) In December 1960, Central Committee made a resolution to create the Tselinniy Krai, which comprised five regions of the Northern Kazakh SSR oblasts. Akmolinsk Oblast was ceased to exist as a separate administrative entity. Its districts were directly subordinated to the new krai administration, and Akmolinsk became the krai capital, as well as the administrative seat of the new Virgin Lands economic region. 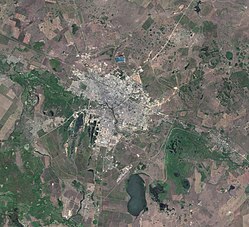 On 14 March 1961, Khrushchev proposed to rename the city to name corresponding to its role in the Virgin Lands Campaign. On 20 March 1961, the Supreme Soviet of the Kazakh SSR renamed Akmolinsk to Tselinograd. On 24 April 1961, the region was reconstituted as Tselinograd Oblast. In the 1960s, Tselinograd was completely transformed. In 1963, work on the first three new high-rise housing districts began. In addition, the city received a number of new monumental public buildings, including the Virgin Lands Palace, a Palace of Youth, a House of Soviets, a new airport, and several sports venues. In 1971, the Tselinniy Krai was abolished and Tselinograd became the center of the oblast. After the dissolution of the Soviet Union and the consequent independence of Kazakhstan, the city's original form was restored in the modified form Akmola. On 6 July 1994, the Supreme Council of Kazakhstan adopted the decree "On the transfer of the capital of Kazakhstan". After the capital of Kazakhstan was moved to Akmola on 10 December 1997, the city was consequently renamed Astana in 1998. On 10 June 1998, Astana was presented as the capital internationally. On 16 July 1999, Astana was awarded the medal and title of the City of Peace by UNESCO. On 19 March 2019, the Kazakh president Nursultan Nazarbayev resigned, and on 23 March the city was renamed Nur-Sultan. Astana is located in central Kazakhstan on the Ishim River in a very flat, semi-arid steppe region which covers most of the country's territory. It is at 51° 10' north latitude and 71° 26' east longitude. The city encompasses 722.0 square kilometres (278.8 sq mi). The elevation of Astana is 347 metres (1,138 ft) above sea level. Astana is in a spacious steppe landscape, in the transitional area between the north of Kazakhstan and the extremely thinly settled national center, because of the Ishim River. The older boroughs lie north of the river, whilst the new boroughs are located south of the Ishim. The time offset from the UTC used by Astana is 6 hours after UTC, or UTC+6:00. This is also used by most of Kazakhstan and Almaty. Astana is the second-coldest national capital in the world after Ulaanbaatar, Mongolia, a position formerly held by Canada's capital, Ottawa, until Astana, attained capital city status in 1997. Astana has an extreme continental climate with warm summers (featuring occasional brief rain showers) and long, very cold, dry winters. Summer temperatures occasionally reach +35 °C (95 °F) while −30 to −35 °C (−22 to −31 °F) is not unusual between mid-December and early March. Typically, the city's river is frozen over between the second week of November and the beginning of April. Astana has a well-deserved reputation among Kazakhs for its frequent high winds, the effects of which are felt particularly strongly on the fast-developing but relatively exposed Left Bank area of the city. As of September 2017, the population of Astana was 1,029,556; over double the 2002 population of 493,000. Many argue that a drive to attract ethnic Kazakhs northward was the key factor in shifting the capital, which was officially put down to lack of space for expansion in the former capital, Almaty, and its location in an earthquake zone. Astana would also be 'closer to the industrial center of Kazakhstan' than Almaty. According to the 1999 Census, 40.5% of the population was Russian, 5.7% Ukrainian, 3.0% German, 2.6% Tatar, 1.8% Belarusian and 0.8% Polish. But at 41.8%, Kazakhs outnumbered Russians and formed the largest ethnic group, while Ingush and Korean each accounted for 0.6%. Others, mostly Uzbeks, accounted for 3.8%. In 1989, Astana had a population of 281,000. The ethnic mix was about 30% Kazakh and 70% Russian, Ukrainian and German. By 2007, Astana's population had more than doubled since becoming the capital, to over 600,000, and it topped 1 million in 2017. Migrant workers—legal and illegal—have been attracted from across Kazakhstan and neighboring states such as Uzbekistan and Kyrgyzstan, and Astana is a magnet for young professionals seeking to build a career. This has changed the city's demographics, bringing more ethnic Kazakhs to a city that formerly had a Slavic majority. Astana's ethnic Kazakh population has risen to some 60%, up from 17% in 1989. According to preliminary figures, Astana had 700,000 inhabitants in late 2007. Islam is the predominant religion of the city. Other religions practiced in Astana are Christianity (primarily Russian Orthodox, Roman Catholicism, and Protestantism), Judaism, and Buddhism. The Palace of Peace and Reconciliation was specially constructed in 2006 to host the Congress of Leaders of World and Traditional Religions. It contains accommodations for different religions: Judaism, Islam, Christianity, Buddhism, Hinduism, Taoism and other faiths. The pyramid-shaped building would express the spirit of Kazakhstan, where cultures, traditions and representatives of various nationalities coexist in peace, harmony and accord. The metropolitan area centered upon Astana includes the Arshaly, Shortandy, Tselinograd and (partially) Akkol District districts of Akmola Region. The area contains 1.2 million people. The Astana International Financial Center (AIFC) opened in July 2018 to become a hub for financial services in Central Asia. The Astana – New City special economic zone was established in 2001 to help develop industry and increase the attractiveness of the city to investors. The SEZ plans to commission five projects worth 20 billion KZT (around $108 million) in the Industrial Park #1 in 2015. The projects include construction of a plant for production of diesel engines, a fast food complex, temporary storage warehouses and a business center, a furniture factory, and production of military and civil engineering machinery. The new Astana International Financial Centre is due to launch on 1 January 2018. Astana is subdivided into three districts. Almaty District was created on 6 May 1998 by presidential decree. The district's territory encompasses an area of 21,054 hectares (52,030 acres; 81.29 square miles) with a population of 375,938 people. The district has five villages. Yesil District, which is also called left bank of the city, was created on 5 August 2008 by presidential decree. The district's territory encompasses an area of 31,179 ha (77,040 acres; 120.38 sq mi) with a population of 119,929 people. Saryarka District was created on 6 May 1998 by presidential decree. The district's territory encompasses an area of 19,202 ha (47,450 acres; 74.14 sq mi) with a population of 339,286 people. In April 1998, the Government of Kazakhstan asked architects and urban planners of international renown to participate in a design competition for the new capital. On 6 October 1998, Japanese architect Kisho Kurokawa was awarded the First Prize. Kurokawa's proposal aimed to preserve and redevelop the existing city, and create a new city at the south and the east sides of the Ishim River, enabling the Symbiosis of the History and the Future. North of the railway line, which crosses Astana in an east-west direction, are industrial and poorer residential areas. Between the railway line and the Ishim river is the city center, where at present intense building activity is occurring. To the west and east are more elevated residential areas with parks and the new area of government administration to the south of the Ishim River. Here many large building projects are under way; for example, the construction of a diplomatic quarter, and a variety of different government buildings. By 2030, these quarters are to be completed. Astana's current chief planner, Vladimir Laptev, wants to build a Berlin in a Eurasian style. He has stated that a purely administrative capital such as Canberra is not one of his goals. The city has a variety of sporting teams. The major association football team is the FC Astana of the Kazakhstan Premier League. Founded in 2009, Astana won four league titles, three Kazakhstan Cups and two Kazakhstan Super Cups. Their home ground is the Astana Arena, which is also serves as a home for the Kazakhstan national football team and the FC Bayterek. The FC Bayterek is a member of the Kazakhstan First Division. They were founded in 2012, to develop youth football. The FC Astana-1964 is based in the Kazhymukan Munaitpasov Stadium and plays in the Astana Municipal Football League. The club's most successful years were 2000s, when they won 3 league titles. Astana is home to several professional ice hockey teams. The Barys Astana, a founding member of the Kontinental Hockey League in 2008 and based in the Barys Arena. The Nomad Astana and HC Astana play in the Kazakhstan Hockey Championship. The Snezhnye Barsy of the Junior Hockey League is a junior team of the Barys Astana. Astana annually hosts the President of the Republic of Kazakhstan's Cup ice hockey tournament. Astana has many universities and junior colleges. as of the 2013/2014[update] academic year, Astana had a total enrollment of 53,561 students in its 14 higher educational institutions, a 10% increase from the prior year. The L.N.Gumilyov Eurasian National University is the biggest university in Astana with 16,558 students and 1,678 academic staff. It was founded as the result of merging the Akmola Civil Engineering Institute and Akmola Pedagogical Institute on 23 May 1996. The oldest university in Astana is the S.Seifullin Kazakh Agro Technical University founded in 1957. Nazarbayev University is an autonomous research university founded in 2010 in partnership with some of the world's top universities. The Kazakh University of Economics, Finance and International Trade is an economic institution in Astana. The Kazakh Humanities and Law Institute is a law university founded by initiative of Ministry of Justice in 1994. The Astana Medical University was the only medical school in Astana until the opening of the School of Medecine at Nazarbayev University in 2014. The Kazakh National University of Arts is the premier music school and has provided Astana with highly qualified professional specialists in the field of Arts. Public transport in Astana consists of buses and share taxis. Over 720,000 people use public transport daily. There are over 40 bus lines served by more than 1000 vehicles, with over 3000 people working in the public transport sector. Just like buses, share taxis have their own predefined routes and work on a shared basis. There are nine share taxi routes in total. In 2011, Akimat of Astana established a company to implement a series of changes and programmes in the metropolis known as the "New transport system of Astana". As the part of these programmes, Bus rapid transit (BRT) lines are expected to start operating in Astanain 2016. Astana Light Metro is a proposed light rail system. Astana also has air taxi service and the modern Astana Bike bicycle-sharing system. Astana International Airport (IATA: TSE, ICAO: UACC), located 17 kilometres (11 mi) south-east of the city center, is the main gateway for the city's domestic and international civilian air traffic. It is the second-busiest airport in Kazakhstan, with 2,960,181 passengers passing through it in 2014. The airport hosts 13 airlines operating regular passenger flights inside the country and internationally. Air Astana maintains its second-largest hub at the airport. An expected 50% increase in passenger traffic by 2017 has spurred construction of a new terminal with an area of about 40,000 square metres (430,000 sq ft). Astana is located in the center of the country, serving as a well-positioned transport node for rail and automotive networks. M-36 Chelyabinsk-Almaty and A-343 Astana-Petropavlovsk highways are routed through the city. The strategic geographical positioning of Astana allows the city to serve as a transport and reload center for cargoes formed at adjacent stations in the area. On 1 July 2010, at the 153rd General Assembly of Bureau International des Expositions held in Paris, representatives from then Astana presented the city's bid to host the Specialised Expo 2017. Kazakhs concept for this exhibition relates to the impact of energy and social on the modern world. The theme of the Nurstultan Expo was "Future Energy". Expo 2017 opened to much fanfare on June 10, with heads of state from 17 different nations in attendance. The two-millionth visitor was registered on August 7. It is the first world's fair to be held in Central Asia and its central pavilion, Nur Alem, is the largest spherical building in the world. More than 4 million people visited Expo 2017 in Astana, two times more than was expected. Recently it was announced that Expo pavilion will be opened again on 11 November. Entry will be free for all the visitors. The only places that will require additional fees for entry are "Nur Alem" and center of art. The Smart Astana project is an initiative developed by the then Astana city administration that incorporates technology-driven solutions in various sectors, like hospitals, schools, the ticket booking system and street lighting. These projects run on an interconnected application, The Smart Astana. ^ /əˈstɑːnə/, also US: /æˈ-, ɑːˈstɑːnɑː/, UK: /æˈstænə/; Kazakh: Астана; Russian: Астана, translit. Astana. ^ Kazakh: Нұр-Сұлтан; Russian: Нур-Султан, translit. Nur-Sultan. ^ a b c d e f g h Pospelov 1993, pp. 24–25. ^ a b c "Об изменении численности населения Республики Казахстан с начала 2017 года до 1 декабря 2017 года (Citizenship of the Republic of Kazakhstan ... to 1 December 2017)" (in Russian). 4 January 2018. ^ a b Жулмухаметова, Жадра (31 October 2017). "Чиновники работают над тем, чтобы уместить в Астане два миллиона человек" (in Russian). ^ "Postal Code for Astana, Kazakhstan". Postal Codes Database. Retrieved 10 March 2015. ^ "Kazakhstan Country Codes". CountryCallingCodes.com. Retrieved 9 March 2015. ^ "ISO Subentity Codes for Kazakhstan". GeoNames.org. Retrieved 10 March 2015. ^ "Astana". The American Heritage Dictionary of the English Language (5th ed.). Boston: Houghton Mifflin Harcourt. 2014. Retrieved 9 April 2019. ^ "Astana". Collins English Dictionary. HarperCollins. Retrieved 9 April 2019. ^ "Astana" (US) and "Astana". Oxford Dictionaries. Oxford University Press. Retrieved 9 April 2019. ^ "Astana". Merriam-Webster Dictionary. Retrieved 9 April 2019. ^ "Astana, a city of modern structures". Jakarta Times. ^ "Astana, Kazakhstan: the space station in the steppes". The Guardian. ^ "Новый президент Казахстана подписал указ о переименовании Астаны в Нур-Султан". meduza.io (in Russian). Retrieved 23 March 2019. ^ "It's Official: Kazakh Capital Now Called Nur-Sultan". RadioFreeEurope/RadioLiberty. Retrieved 23 March 2019. ^ "О переименовании города Астаны – столицы Республики Казахстан в город Нур-Султан – столицу Республики Казахстан — Официальный сайт Президента Республики Казахстан". Akorda.kz. Retrieved 23 March 2019. ^ a b "Astana, Kazakhstan: the space station in the steppes". The Guardian. 8 August 2010. Retrieved 20 February 2015. ^ Steven Lee Myers (13 October 2006). "Kazakhstan's Futuristic Capital, Complete With Pyramid". The New York Times. Retrieved 6 October 2014. ^ "Astana, the futuristic frontier of architecture". The Guardian. 8 August 2010. Retrieved 6 October 2014. ^ Daisy Carrington (13 July 2012). "Astana: The world's weirdest capital city". CNN. Retrieved 6 October 2014. ^ The Current Digest of the Post-Soviet Press. Current Digest of the Soviet Press. 1994. p. 20. ^ Paul Brummell (7 September 2018). Kazakhstan. Bradt Travel Guides; Third edition. p. 71. ISBN 978-1784770921. ^ "The history of Astana". Akimat of Astana. 19 January 2013. Archived from the original on 7 October 2014. Retrieved 6 October 2014. ^ "Nursultan, not Astana — Kazakhstan renames capital to honor Nazarbayev". Deutsche Welle. Retrieved 23 March 2019. ^ Ian MacWilliam (20 April 1994). "In Virgin Lands, a Dream Ends". The Moscow Times. Retrieved 13 January 2015. ^ a b c d Kozlov & Gilburd 2013, p. 293. ^ a b Khrushchev 2010, p. 739. ^ Kozlov & Gilburd 2013, p. 295. ^ Kozlov & Gilburd 2013, p. 296. ^ a b "Astana – the capital of the Republic of Kazakhstan". e-history.kz. Retrieved 23 February 2015. ^ "Astana – the capital of the Republic of Kazakhstan". Official site of the President of the Republic of Kazakhstan. Archived from the original on 17 March 2015. Retrieved 10 March 2015. ^ "Politics this week". The Economist. 23 March 2019. p. 7. Retrieved 24 March 2019. Nursultan Nazarbayev, Kazakhstan’s strongman president of 30 years, resigned abruptly. He retains considerable influence; his daughter is the new chairman of the Senate and the constitution gives him lifetime immunity from prosecution. The capital, Astana, is to be renamed Nursultan after him. ^ Brian White (9 January 2013). "Ulaanbaatar is the Coldest Capital". The Mongolist. Retrieved 19 February 2015. ^ "Still the third-coldest capital, despite balmy temperatures". Canada.com. 4 January 2007. Archived from the original on 6 June 2015. Retrieved 19 February 2015. ^ a b "Weather and Climate-The Climate of Astana" (in Russian). Weather and Climate. Retrieved 8 February 2015. ^ "Akmola (Astana) Climate Normals 1961–1990". National Oceanic and Atmospheric Administration (NOAA). Retrieved 8 February 2015. ^ "Население Астаны". www.demoscope.ru. Retrieved 31 December 2017. ^ Encarta-encyclopedie Winkler Prins (1993–2002) s.v. "Kazachstan. §5. Geschiedenis". Microsoft Corporation/Het Spectrum. ^ "Astana". Angelfire.com. Retrieved 21 October 2012. ^ "Kazakhstan's Capital Holds a Lavish Anniversary Celebration". EurasiaNet.org. 8 July 2007. Retrieved 24 November 2013. ^ "Religion in Astana - Astana". www.astana-hotels.net. Retrieved 31 December 2017. ^ "Kazakhstan: Staff Concluding Statement of the 2018 Article IV Mission". IMF. ^ "Astana celebrates 16th anniversary as Kazakhstan's capital". Tengrinews.kz. 9 July 2014. Retrieved 19 February 2015. ^ "Poverty in Kazakhstan: Causes and Cures" (PDF). UNDP Kazakhstan. Archived from the original (PDF) on 3 March 2016. Retrieved 19 February 2015. ^ a b c "Five projects to be launched in Astana industrial park this year". The Times of Central Asia. 5 February 2015. Archived from the original on 19 February 2015. Retrieved 20 February 2015. ^ "Over 170 thousand of people involved in small and medium enterprise in Astana". Akimat of Astana. 14 March 2014. Archived from the original on 16 February 2015. Retrieved 26 January 2015. ^ a b "Number of small and medium-sized business entities grew by 13.7% in Astana". inform.kz. ^ "The Smart21 Communities of the Year". www.intelligentcommunity.org. ^ "Kazakhstan's New Capital Is Growing Up Quick". Forbes. ^ "Vth Congress of Leaders of World and Traditional Religions". UNESCO. ^ a b Whyte 2000, p. 216. ^ Достижения [Achievements] (in Russian). Astana F.C. Retrieved 21 August 2014. ^ ФК "Байтерек" – новый клуб из столицы [FC Bayterek – the new club from the capital] (in Russian). Total.kz. 30 March 2012. Retrieved 21 August 2014. ^ "Barys Astana". Kontinental Hockey League. Retrieved 7 October 2014. ^ "Snezhnye Barsy". Junior Hockey League. Archived from the original on 14 October 2014. Retrieved 7 October 2014. ^ Paul Bartlett (8 August 2010). "Ice Comes Early for Astana Hockey Fans". Eurasianet.org. Retrieved 7 October 2014. ^ "UCI WorldTeams". Union Cycliste Internationale (UCI). Retrieved 5 March 2015. ^ a b c "History". BC Astana. Archived from the original on 9 October 2014. Retrieved 7 October 2014. ^ "Preview: 2011 UCI Track World Cup Round 1". BritishCycling.org.uk. 27 October 2011. Retrieved 7 October 2014. ^ Ilyas Omarov (4 July 2013). "Astana Presidential Sports Club Launched". The Astana Times. Archived from the original on 24 April 2015. Retrieved 21 August 2014. ^ Paul Osborne (9 April 2014). "Astana Presidential Sports Club outlines vision to boost Kazakhstan's image". insidethegames.biz. Retrieved 21 August 2014. ^ Dmitry Lee (3 March 2015). "Alau Ice Palace Hosts World Sprint Skating Championship, Kazakh Skaters Fail to Reach Podium". The Astana Times. Retrieved 5 March 2015. ^ Nazymgul Kumyspaeva. "International President's Cup tennis tournament kicked off in Astana". KazPravda.kz. Retrieved 7 October 2014. .
^ "The number of university students in Astana increased by more than 10%". Akimat of Astana. 3 March 2014. Archived from the original on 14 October 2014. Retrieved 8 October 2014. ^ История и ЕНУ сегодня [History and ENU today] (in Russian). L.N.Gumilyov Eurasian National University. Retrieved 7 October 2014. ^ "History of the university". S.Seifullin Kazakh Agro Technical University. Retrieved 7 October 2014. ^ "History & Strategy". Nazarbayev University. Retrieved 7 October 2014. ^ "Kazakh University of Economics, Finance and International Trade (KazUEFIT)". EURASHE.eu. Retrieved 11 June 2015. ^ "History of KAZGUU". Kazakh Humanities and Law Institute. Archived from the original on 11 October 2014. Retrieved 7 October 2014. ^ "About the University". Astana Medical University. Retrieved 7 March 2015. ^ "About us". Kazakh National University of Arts. Retrieved 8 October 2014. ^ "5 new schools open doors in Astana today". Kazinform. 1 September 2014. Retrieved 7 October 2014. ^ "13,000 to start school this year in Astana". Kazinform. 4 August 2014. Retrieved 7 October 2014. ^ "General information about school". Miras International School. Retrieved 8 October 2014. ^ "About Us". Archived from the original on 27 April 2018. Retrieved 15 February 2019. ^ "Intellectual schools". Nazarbayev Intellectual Schools. Retrieved 7 October 2014. ^ "QSI International School of Astana". Quality Schools International (QSI). Retrieved 28 November 2014. ^ Ainur Kuramyssova (17 December 2014). "36 Buses Added to Astana's Most Popular Routes". The Astana Times. Retrieved 23 February 2015. ^ "Astana Public Transportation". world66.com. Archived from the original on 23 February 2015. Retrieved 23 February 2015. ^ Yusup Khassiev (17 October 2012). "Astana: an advancing city in the modern age". International Association of Public Transport. Retrieved 23 February 2015. ^ "350 French buses working on natural gas are to be delivered in Astana in 2014". Akimat of Astana. 27 December 2013. Archived from the original on 24 February 2015. Retrieved 24 February 2015. ^ "Astana rejects Light Rail Transport system in favor of rapid bus network". The Times of Central Asia. 29 November 2013. Archived from the original on 2 April 2015. Retrieved 16 March 2015. ^ Dmitry Lee (20 January 2015). "Astana-based Company Launches Kazakhstan's First Air Taxi Service". The Astana Times. Retrieved 17 February 2015. ^ Международный аэропорт Астаны [Astana International Airport] (in Russian). Aeroport.kz. Retrieved 22 February 2015. ^ "Passenger traffic". Astana International Airport. Retrieved 16 February 2015. ^ "General information". Astana International Airport. Retrieved 16 February 2015. ^ "No People's IPO for Air Astana in near future: Samruk Kazyna". Tengrinews.kz. 31 July 2014. Retrieved 17 February 2015. ^ "Passenger traffic in Astana airport to increase to 5 million passengers a year by 2017". Akimat of Astana. 26 February 2013. Archived from the original on 16 February 2015. Retrieved 16 February 2015. ^ "New Passenger Terminal will be created after the Capitals Airport Reconstruction". Akimat of Astana. 6 November 2014. Archived from the original on 15 February 2015. Retrieved 16 February 2015. ^ ""Astana" station". Kazakhstan Temir Zholy. Archived from the original on 15 February 2015. Retrieved 16 February 2015. ^ "Kazakh-Spanish trains to become more comfortable". Tengrinews.kz. 28 January 2015. Retrieved 5 March 2015. ^ "Astana will construct new railroad station for EXPO-2017". Tengrinews.kz. 17 January 2013. Retrieved 5 March 2015. ^ "Expo2017: Future Energy and Impact on our Lives". Astana Economic Forum. Archived from the original on 23 July 2014. ^ "Vision". expo2017astana.com. Archived from the original on 5 May 2016. ^ "APCO Worldwide to Drive Energy Innovation Future as Chief Organizing Partner for USA Pavilion at Expo 2017". ^ "Astana city". OrexCa. Retrieved 3 May 2016. ^ "Partner Cities". Gdańsk Official Website. Retrieved 9 October 2014. ^ "Saint Petersburg to welcome Days of Astana Culture". Kazinform. Retrieved 9 October 2014. ^ "Tbilisi Sister Cities". Tbilisi Municipal Portal. Archived from the original on 24 July 2013. Retrieved 5 August 2013. ^ "Riga's Twin Cities". Municipal Portal of Riga. Retrieved 9 October 2014. ^ "Sister Cities of Ankara". Greater Municipality of Ankara. Retrieved 9 October 2014. ^ "Miasta partnerskie Warszawy" [Twin cities of Warsaw] (in Polish). City of Warsaw. Retrieved 9 October 2014. ^ Bangkok Metropolitan Administration (11 June 2004). "Agreement on establishment of bilateral relations between the Akimat of Astana City of the Republic of Kazakhstan and the City of Bangkok of Kingdom Thailand" (PDF). Retrieved 9 October 2014. ^ "Sister Cities". Beijing Government. Retrieved 23 June 2009. ^ "Ufa and Astana Signed Agreement on Friendship and Cooperation". Ufa City Municipality. Archived from the original on 16 October 2014. Retrieved 17 October 2010. ^ Бишкек и Астана — города-побратимы [Bishkek and Astana — Sister Cities] (in Russian). Official website of City Hall of Bishkek. 12 September 2011. Retrieved 9 October 2014. ^ "Astana and Finnish Oulu become twin-cities". Tengrinews.kz. 19 April 2013. Retrieved 9 October 2014. ^ "Astana and Nice established twin relations". Akimat of Astana. 5 July 2014. Archived from the original on 15 October 2014. Retrieved 9 October 2014. ^ a b "Astana moving closer to becoming smart city". astanatimes.com. Mallone, Laura (23 September 2016). "The Eccentric Autocrat Who Spent Billions Inventing A City". Wired.